Staying in Uzes for 25 days means I want to see what it’s like living here. .. not just being a tourist. So after three days, I’m beginning to settle in. That means I’m stocking up the fridge and beginning to learn my way around. After spending a leisurely morning in the loggia enjoying my coffee, chocolate croissant and a Bach piano concerto on the stereo, I set out for a walking tour of the neighborhood. Here are some of the sights within a few blocks of my apartment. During my walk, lo and behold, what should I wander into back at the main plaza, but a Sunday market! More shopping! 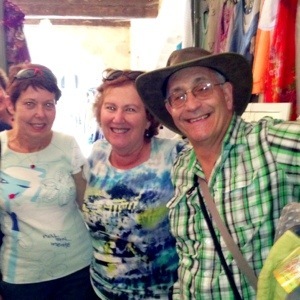 Check out this fabulous jewelry from an artisan from Avignon. A new BFF! Tomorrow, a guided tour of the city. Please join me. 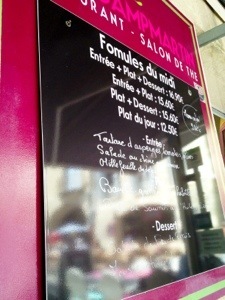 Now that I’ve discovered I can blog about my visit to Uzes on my iPhone, my tech problems may be solved. You won’t see the most professional layout, but hopefully, you’ll enjoy the monologue and photos. Saturday Market Day usurps any other business activity that might go on in the historic district of the small town. Lots of the permanent shops are closed. Vendors are everywhere, not just in the plazas; but also, along the main streets. Today’s purchases included a little something from almost every vendor shown here. Plus, a handmade leather bracelet with silver clasp that just had to go home with me. Anyone who knows me has to admit I’m a diehard shopper. Thank goodness my new acquaintances from Australia were willing to give my new couture their approval. A wonderful start to my visit — lunch at a charming cafe near the Place aux Herbes..
… And children chattering below my window on their way home from school. Oh yes, I did take a few minutes to walk by THE fountain. The one that entranced me two years ago. Tomorrow it will be surrounded by Saturday Market vendors. See you there! OMG! This place is better than I remembered. A true heaven on earth! After leavinq the hotel yesterday morning, I took a cab to the train station. My luck had taken a turn for the worse with computer problems and no AC in my hotel room, so I decided to take no chances and get a cab to the train station. The scenery from the train wasn’t as exciting as I expected, and the windows of my coach were dirty, so I didn’t get the spectacular views and photos I hoped for. However, it was exciting enough traveling at 250 km/hr to get to Nimes just after noon. Before leaving the states I messaged a friend I met in France in 2011 to see if we could meet up sometime in Uzes. Good news, he was available to meet me at the train in Nimes. After a “welcome back” lunch and chance to catch up on the last two years, Sandy and his friend, Maggie, dropped me at my door in Uzes. In addition to the ride and lunch, I picked up some great sightseeing and photo tips since they are both accomplished travelers and photographers. Here’s my home-away-from-home. Ain’t it great? Procrastination is one of my biggest faults. Packing for this trip was no exception and now it’s time for my south France adventure. Only four more days until I leave for my great adventure. Destination Uzes France. Solo. Just as planned. 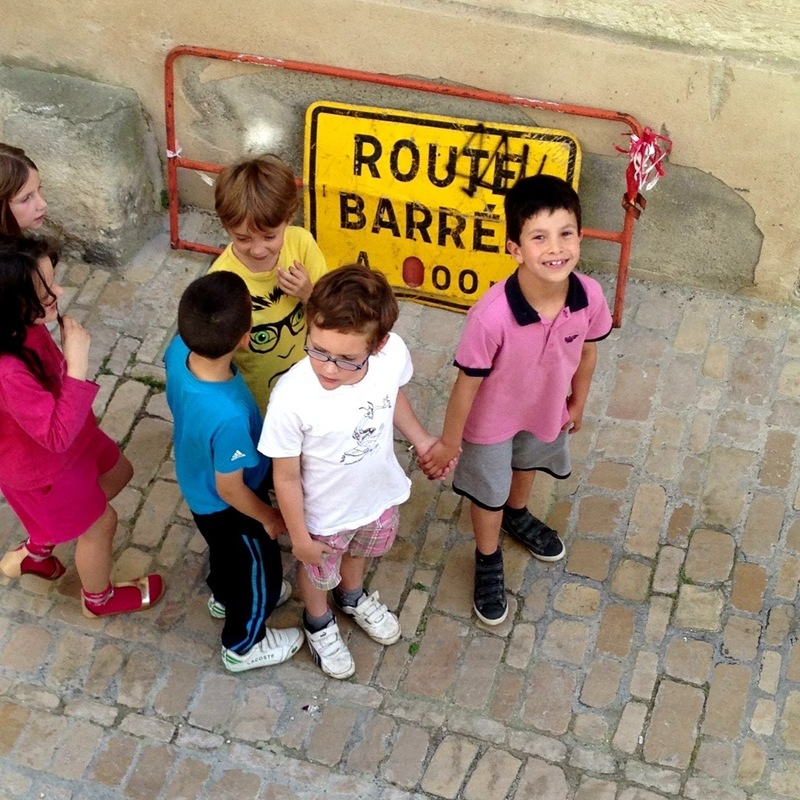 This is my first time blogging an adventure, so I’ll start by telling why I’m heading to Uzes, France; how I’m getting there; also, I’ll describe how I arrived at the itinerary– sketchy as it is. I confess, I’ve been to Uzes. I visited there during a “great adventure” in 2011. My main destination was London to see Prince William kiss his bride on the balcony of Buckingham Palace. However, quite “out of the blue,”I had the opportunity to take off for France and to spend a Saturday market day in Uzes. Right then, that day, I swore to myself I would return to that exact spot. 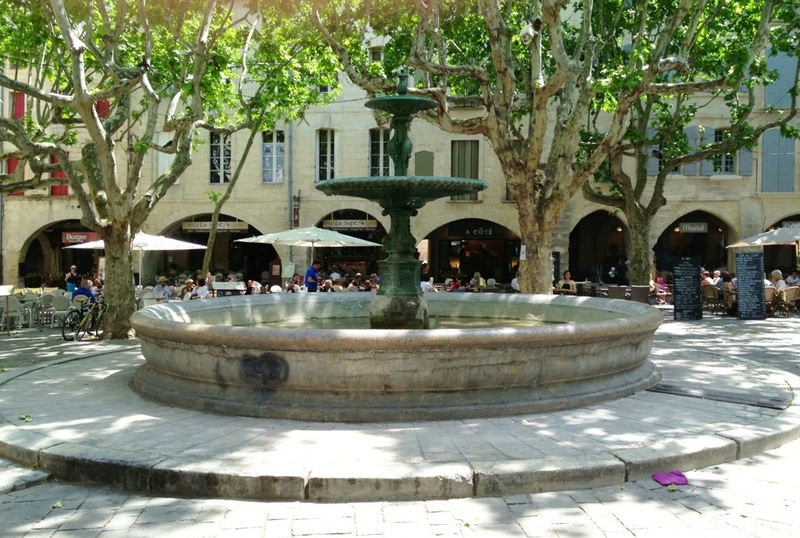 Why did I choose to make Uzes the centerpiece of my adventure through the south of France? If it was not reason enough that the walled, historic city was beyond charming, there were other reasons. It’s somewhat out-of-the-way, so I figured large crowds of tourists wouldn’t gather there. It’s also very close to Arles, Avignon, Nimes and other places I wanted to see. I started with a budget. My first trip to Europe was in 1966. I traveled with two friends from UNC-Chapel Hill and we spent two-and-a-half months in England and around most of western Europe. Our “bible” was the book titled, “Europe on $5-a-Day.” Dare say, I knew there wasn’t a chance I’d survive on our 1966 budget, but I knew there were ways to keep costs down so that I could afford a fabulous trip abroad for less than I thought. My goal was to spend six weeks living, exploring and learning about the south of France and Barcelona on a $5000 budget (excluding airfare). Six weeks? Choosing to make this a six-week trip was somewhat arbitrary. I wanted to stay as long a possible on my allotted budget, so I started checking on the cost of lodging in Uzes. I turned to AIRBNB, the travel website recommended to me by friends and a site that I had used on a trip to Frederick, Maryland. The room I booked at the B&B in Frederick was delightful. With a little searching around on the website, I found the perfect location in Uzes, at a reasonable price. The four-story apartment with one room on each floor was located within the walled city. I could have the whole place to myself from June 6-29. Once I had some dates to work with, the itinerary for the trip began to take shape. 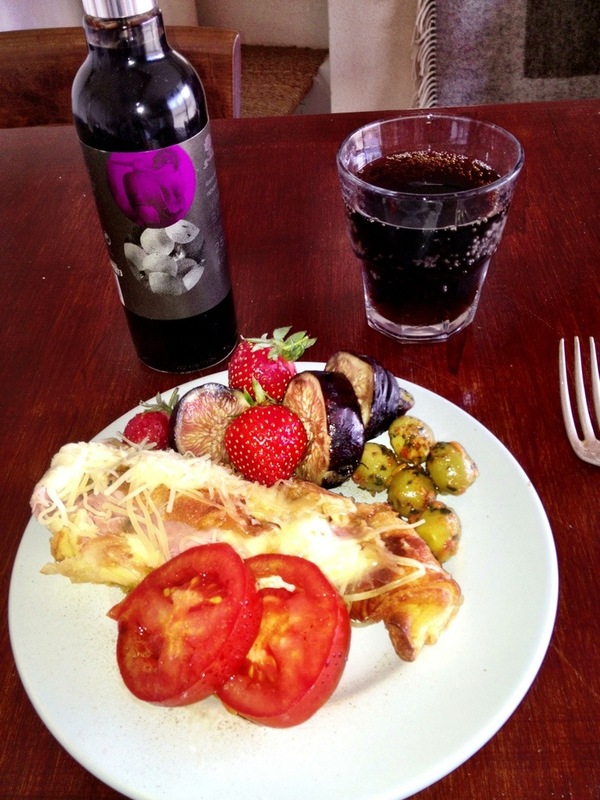 I started to communicate directly with the apartment owner in Uzes (who lives in Copenhagen). He advised me to fly in and out of Barcelona so that I could enjoy the train ride through the countryside to Uzes. He also recommended that I stay in Barcelona my first night after the transatlantic flight so that I could fully enjoy the train ride the next day. Sete. Here’s where the plan got creative. I wanted to visit a town on the Mediterranean after leaving Uzes that would take me south towards Barcelona and my flight home. Plotting a course on Google Earth, I stumbled upon Sete, France. Reading a few travel reviews, I quickly realized Sete was a little jewel. Checking with AIRBNB, I found there was an apartment “to die for” waiting for me. I connected with the hostess and, as luck would have it, I learned about the worldwide music festival in town during that time. That was good news and bad news. It meant I could only have the dream room for 2 nights, but it also led me to a bit of luck. My hostess managed to arrange a place for me in the home of her friend for the rest of my stay. A guest house directly on the ocean — all for me, and right on budget! More good news is that my hostess runs a wine tour. So I booked the stay and a tour. Whoopee! “Sketchy” is good. Really. I mean, everyone needs to schedule in time for a real adventure. A side trip. A chance to do something amazing — an experience of a lifetime, I knew I had to allow a few days to wing it. I could always come up with a plan. For example, if nothing else, I could take off from Sete and head west toward the wine country of Languedoc. It would be fun to stay in a winemaker’s cottage. To stomp grapes… like Lucy Ricardo. Or, I could spend time wandering along the Costa Brava. Winging it could be the best part of the adventure! The lodging I found through AIRBNB in Barcelona was an apartment in El Born — a popular district in Barcelona that’s filled with history, neat shops, tapas bars and restaurants. Most importantly, the El Born is safe for solo travelers. Safe enough, that is. I knew I to watch for pickpockets wherever I went in the city. I visited Barcelona, on my “Europe on $5 a Day” trip in 1966. I remember a bullfight, some great paella, and a quick trip from Barcelona to Majorca. Honestly, I hadn’t thought much about Barcelona since then. But when I saw I had an opportunity to revisit the city, I knew I wanted to spend more than an overnight. I have 3 guide books and a picture book about Gaudi to study before I get there. Plus, I would have no problem meeting people along the way who would give me lots of advice. Again, I’d be winging it. This unplanned adventure in Barcelona could be very special. Home again! The end of another great adventure and the beginning of the next unknown.